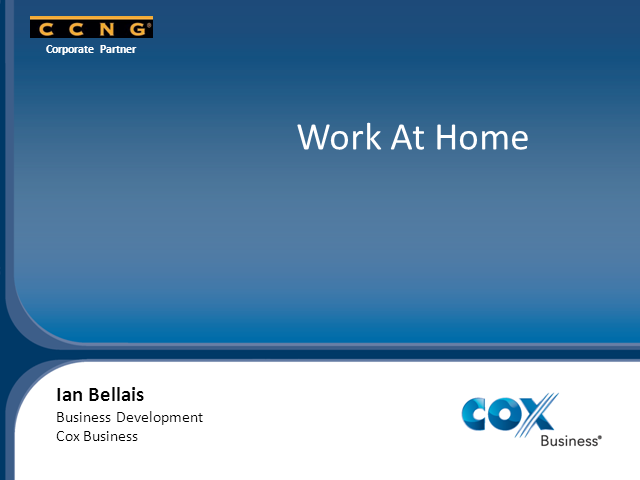 CCNG talks with Ian Bellais, Business Development Manager at Cox Business about their approach to remote workforce solutions in the contact center. Building a best-in-class customer service team and customer-centric organization is a marathon, not a sprint. Your customers, and your c-suite, are pressuring you to innovate and improve. But how do you take the first step and keep on pace on your transformation -- while executing on the daily operational pressures? Join CCNG and Chris Bauserman, VP Segment and Product Marketing for NICE inContact, for a discussion and set of tools that you can use to benchmark your operations and identify the next best action your organization can take to build your CX of the future. - New consumer research: How are your customers' expectations changing? - CX Maturity Model diagnostic: Where do your CX operations stack up vs. your peers? - Personalized next steps: What 2019 hot topics are right for you to adopt? Join CCNG and best selling author Joseph Michelli as we discuss how to drive loyalty and engagement to achieve an outstanding customer experience. Outstanding customer experiences don’t happen by default. They are the result of well-designed products and processes that consistently meet needs, reduce effort, and deliver memorable moments. During this interview, Joseph will explain the essential competencies needed to deliver outstanding experiences to every customer, every time – no excuses. He will share context and tools to elevate the experience of your internal and external customers by focusing on and integrating people, process, and technology. CCNG's Executive Director - Magnet Program, Lon Hendrickson, interviewed Lark Will of eBay regarding her "Perspectives On Leadership." Watch this interview as Lark shares her insights and experiences relating to omnichannel and how to ensure brand consistency across all channels. We invite you to view our discussion with Greg Alcorn, President of GCS, about his new book entitled "7 Dumb Things We All Say: Smart Ways to Improve Every Relationship" which focuses on applying “soft skills”. It’s loaded with personal examples, helpful hints, and common-sense principles. The subjects and principles apply to ALL types of relationships – friends, family, and business. As customer service professionals, we sit in the midst of the most important paradigm shift within the industry today – the Digital Transformation. This shift has brought more focus on and relevance of the business potential of contact centers than ever before. In this session, we’ll take a look at why Digital Transformation matters, what it means, and how organizations are successfully redefining their contact centers for extended reach and impact. No longer can we hide behind old technological limitations that may have prevented responsive, personal interactions. Today customers are demanding great experiences and are driving change. Either we give them the TLC they are looking for…. or our competitors do it for us. How can you progress CX and what are the first steps you should take to do so? Watch this brief interview between CCNG and NICE inContact where we share some highlights for our upcoming webinar on May 16, 2019. Join us for this interactive discussion where we will break into bite size pieces what steps you should be taking to build your CX of the future. - What do your customers think? - Maturity Model - Where do you stack up? - What is the framework for your personalized road map to building your CX of the future? To register for this webinar, click the "Attachments" tab, and then click the webinar registration link. We'll see you there! The world of customer experience is continuously evolving. It is common knowledge that you must offer your customers one-on-one interactions that stand out among the rest, but do your agents have what they need to be successful? Ring in 2019 … Join us for a discussion on how machine learning analytics drives quality assurance. Imagine having machine learning to process and interpret large volumes of data, especially all of your calls -- which drive action through decisions and predictions … on a scale and speed of data consumption that we as humans can’t match. Machine learning is dynamic. It learns and becomes “smarter” the more data it processes. Forget the debate on statistically significant sample size, and begin to analyze the total population of calls with machine learning. This will better drive targeted action for coaching, developing staff, and identifying broken processes. Machine learning helps us understand “what was said” as well as considering “tone” and “sentiment” (or emotions), all while helping with compliance, security, regulations, etc., and allowing you to focus on the customer experience. During this webcast, Roger Lee, Director Customer Success for Gridspace, will share his thoughts on how we as contact center leaders, process improvement experts, and quality monitoring gurus can use machine learning speech analytics to improve both the customer and employee experience. 2. Why automate and how? 3. How to utilize the analyses from analytics-driven QA for both contact center and enterprise. Intraday management is one of the highest priorities and most demanding tasks for contact center managers. Mobile self-service provides supervisors with the tools needed to quickly adapt to unexpected changes, manage all aspects of schedules, and better communicate with their agents. During this webinar we will discuss how to use the mobile app from a managerial and agent point of view, and show how agents can view/change schedules, manage preferences, receive push notifications, shift trade, and more. Attracting and retaining agents can be a cumbersome task for contact centers. In many ways, they (agents) expect a blending of their work and personal lives. A WFM mobile app keeps agents engaged, provides a better work-life balance, and ensures time management and collaboration, while giving supervisors and analysts the ability to quickly identify problems and take action to ensure proper staffing and service levels are met. Join us as we discuss how intraday management with a mobile app is helping contact centers to connect and empower their agents. Perspectives On Leadership is an executive interview series from the CCNG Magnet Program. These one-on-one conversations with Contact Center Leaders explore their perspectives, insights, and experiences on effective leadership. Part of the CCNG Executive Perspectives webcast series. Contact centers are evolving, allowing customers to self-serve more complex tasks without agent involvement. But when agents must step in, customer experience suffers due to limited access to critical information. Join us for this live webinar as we discuss how best-in-class organizations are building a unified customer engagement center through the use of softphones and omnichannel widgets - where agents are empowered to focus on the business processes to better serve their customers. CCNG spoke with member Metro by T-Mobile, a 7-time J.D. Power award winner, to discuss how they achieved this most recent award. Watch this brief interview to learn about the Metro by T-Mobile contact center structure, culture, and leadership that enabled them to be recognized as a leader in the wireless industry. Let’s face it … we can no longer abide by the working rules of yesteryear. The new generation of contact center agents have grown up using mobile devices, and that means companies need the ability to quickly communicate with their agents and provide a real-time, two-way communication stream. To be successful, organizations need to engage their employees with a WFM mobile app. Empowering your agents with a mobile app leads to a better work-life balance, enhanced communications, and a streamlined scheduling process. This webinar will explore the impact a mobile app can have on your contact center agents, business, and customer experience. When your customers communicate with you via chat, phone call, etc., do they have to repeat information already provided when being routed to an agent? Do your call center agents have the tools they need to provide an effective customer service? Watch this 3-minute video and then register to join us for a webinar as we discuss how the tools your agents have access to plays a key role in delivering the right data so you are able to provide the best possible customer experience. To register for this webinar, click on the "Attachments" box above, then click the link to register. What are companies with superior customer experiences doing differently? Join industry leaders John Irey and Greg Cummings as they share the strategy behind an effective omnichannel customer care success model. Participate in a discussion on how self-service, AI, and digital tools are shaping the customer journey and how to leverage that knowledge to build a better digital plan. Benefit from shared examples of the best and worst attempts at omnichannel and get equipped with the tools necessary to build your own strategy. Greg Cummings - Greg has 20 years of industry experience in consulting, operations, and contact centers -- helping to drive process improvement through an outcomes based methodology. He is currently Manager Global Channels with NICE inContact. John Irey - John, a contact center Principal Consultant at Mindsight, is an 18 year veteran assisting in the full life cycle of contact center engagements. His experience in both solutions and deployment engineering roles gives him deep insight into the strategy behind developing an omnichannel contact center solution for every business need. The digital customer experience is moving at a rapid pace. Many of us have engaged in the digital conversations taking place, but how are you addressing CX in this digital age? Are you looking ahead and planning for the future? We need to begin now to develop a strategy so we are prepared to address customer concerns via social, mobile, and more. Watch this brief 5-minute interview with Greg Cummings as he shares some highlights of our upcoming webinar on October 16th. To register for the live webinar, click on the "Attachments" box below, then click the link to register. Join us for an interactive discussion where you can ask key questions and take away practical recommendations for calming the chaos in your contact center. Keeping all these "balls" in the air makes it hard to think strategically about how to generate greater efficiency and value. Don't miss this conversation as we work to minimize the chaos so you can see the overall picture more clearly. Wade Myers - Wade has 10 years of experience in voice and data recording solutions for a wide variety of industries focused on solutions high in quality, ease of use, and customer satisfaction. Take a look at this brief video interview with CCNG member Daniel Weiss as he shares his thoughts about participating in a recent CCNG networking event at the Coca-Cola customer operations center in Charlotte, NC. Listen as Daniel discusses the high level of interaction and engagement that took place, and how willing everyone is to share with the group. Consumers are not as likely to fill out surveys as they once were. Survey programs across all industries are struggling to obtain both the quantity and quality of data required to make intelligent decisions. Does this mean that customers are providing less feedback to organizations? Hardly! Feedback is happening all around in new and exciting ways. It’s time that we evolve our ability to listen. Learn the best ways to capture unstructured feedback and take your Voice of the Customer program to the next level! CCNG receives ongoing feedback from our management members in contact center and customer care about the relative hot issues they are most interested in discussing with peers. We bring these Hot Topics to you with regular webcast content provided by our members and partners. Managing your contact center operations to achieve exceptional customer care in your organization requires access to information about the technology, processes, human capital management, and peer knowledge & experiences. CCNG members share their experience and best practices in how they manage customer care in their enterprise contact center operations to improve the overall customer experience. This channel features webcast presentations by thought leaders and award-winning operations who cover the key topic areas in this increasingly changing and dynamic field.